Home Nissan Leaf Nissan is recalling its 2014 Nissan Leaf for possible Circuit Board Voltage where an inverter may fail that may Result in the vehicle possibly shutting down. Nissan is recalling its 2014 Nissan Leaf for possible Circuit Board Voltage where an inverter may fail that may Result in the vehicle possibly shutting down. Nissan North America, Inc. (Nissan) is recalling certain model year 2014 Nissan LEAF vehicles manufactured April 15, 2014, through April 24, 2014. Due to a problem with the motor control circuit board, the inverter may fail, causing the vehicle shut down. An unexpected vehicle shut down increases the risk of a crash. Nissan will notify owners, and dealers will replace the inverter, free of charge. The recall is expected to begin on July 7, 2014. Owners may contact Nissan customer service at 1-800-647-7261. 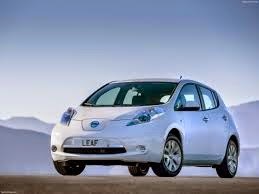 Want a new Nissan Leaf or Nissan Vehicle?